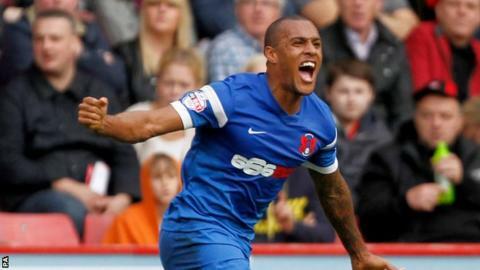 Jay Simpson's fifth league goal of the season helped rescue a point for table-topping Leyton Orient at Cambridge. The away side should have taken the lead midway through the first-half but Simpson could only hit the post after rounding keeper Chris Dunn. Half-time substitute Jacob Blyth gave the U's the lead from close range following good play by Liam Hughes. The visitors soon levelled when Simpson fired home Mathieu Baudry's lofted pass as the game ended in a draw. "I think the way the game has gone, some days it's important not to lose. "We were playing against a team who were top of the league, and they've played like that. We on the other hand are playing like a team that have just lost a little bit of confidence in our ability and our structure. "We need to get it back pretty quickly. "I've just seen some of the shots we had on target in the first half and I don't think their keeper's going to have a day like he's had today for a very long time. "Against the run of play they've got one, rocked us a little bit for a while but then we got back in the game and credit to the boys, especially after last week's result. "We ended up getting a point and had a lot more pressure towards the end of the game." Match ends, Cambridge United 1, Leyton Orient 1. Second Half ends, Cambridge United 1, Leyton Orient 1. Corner, Leyton Orient. Conceded by Chris Dunn. Attempt saved. Sammy Moore (Leyton Orient) right footed shot from outside the box is saved in the top centre of the goal. Attempt missed. Bradley Pritchard (Leyton Orient) header from the left side of the six yard box misses to the left. Corner, Leyton Orient. Conceded by Mark Roberts. Robbie Simpson (Cambridge United) is shown the yellow card. Hand ball by Robbie Simpson (Cambridge United). Foul by Blair Turgott (Leyton Orient). Conor Newton (Cambridge United) wins a free kick on the right wing. Foul by Sammy Moore (Leyton Orient). Goal! Cambridge United 1, Leyton Orient 1. Jay Simpson (Leyton Orient) right footed shot from the centre of the box to the bottom left corner. Assisted by Mathieu Baudry. Corner, Leyton Orient. Conceded by Elliot Omozusi. Attempt saved. Jacob Blyth (Cambridge United) header from very close range is saved in the centre of the goal. Corner, Cambridge United. Conceded by Frazer Shaw. Substitution, Leyton Orient. Blair Turgott replaces Lloyd James. Attempt missed. Robbie Simpson (Cambridge United) right footed shot from the centre of the box is high and wide to the left. Chris Dunn (Cambridge United) wins a free kick in the attacking half. Foul by Paul McCallum (Leyton Orient). Jacob Blyth (Cambridge United) is shown the yellow card for a bad foul. Foul by Jacob Blyth (Cambridge United). Connor Essam (Leyton Orient) wins a free kick in the defensive half. Corner, Leyton Orient. Conceded by Mickey Demetriou. Goal! Cambridge United 1, Leyton Orient 0. Jacob Blyth (Cambridge United) right footed shot from the centre of the box to the bottom left corner. Assisted by Mickey Demetriou. Attempt blocked. Paul McCallum (Leyton Orient) left footed shot from outside the box is blocked. Hand ball by Lloyd James (Leyton Orient). Foul by Jay Simpson (Leyton Orient). Mickey Demetriou (Cambridge United) wins a free kick in the attacking half. Second Half begins Cambridge United 0, Leyton Orient 0. Substitution, Cambridge United. Jacob Blyth replaces Jordan Slew. Substitution, Cambridge United. Liam Hughes replaces Daniel Carr. First Half ends, Cambridge United 0, Leyton Orient 0. Attempt missed. Paul McCallum (Leyton Orient) right footed shot from the centre of the box is close, but misses to the right following a corner. Corner, Leyton Orient. Conceded by Leon Legge. Attempt blocked. Connor Essam (Leyton Orient) right footed shot from the right side of the six yard box is blocked. Attempt saved. Paul McCallum (Leyton Orient) right footed shot from the centre of the box is saved in the bottom right corner.